Minister of Business, Dominic Gaskin. Small business development is next year set to receive a GY$148 million boost to help them set up shop and provide services to large companies, Minister of Business, Dominic Gaskin announced. 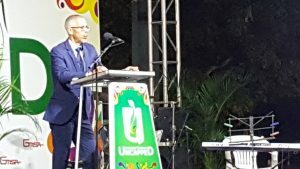 Gaskin said advertisements would be placed at the Bureau on behalf of those companies to promote them to larger enterprises. “These larger enterprises can contact the Bureau whenever a business opportunity arises, and the Bureau would then recommend the qualified companies in this sector of activity. If successful this can be a great program to promote the small businesses of Guyana,” Minister Gaskin told the House. Additionally, GY$100 million have been allocated towards the establishment of a Small Business Development Fund. He said that revolving fund would provide financing to those companies that cannot meet the criteria of traditional banks. Minister Gaskin said that the effective revolving nature of the fund would limit the erosion of its capital. That, he said, would be achieved through careful screening of applicants prior to referral to the programme; frequent review of the performance of the revolving fund; favourable interest rates; and shorter repayment periods (not more than once per year) to allow for timely revolving of funds. Enter your email address to subscribe to this website and receive notifications of new articles by email. Demerara Waves Media Inc. © 2019 | Website developed by GxMedia.